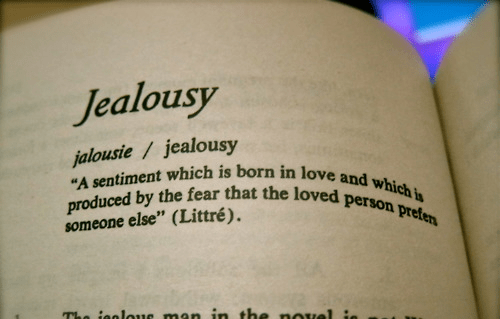 Jealousy is one of the human emotions that most people are far too familiar with because you have either been on the receiving end of jealousy or the one dishing it out. It is by far one of the most destructive of human emotions and has undoubtedly ended more relationships than any other that come to mind and I’m sure you would agree. I know what it’s like to be the giver of this incredibly life draining emotion as does my first girlfriend because she is the one who had to put up with my insanity. I was so incredibly jealous that it affected almost every area of my life. Yup I was the crazy boyfriend calling at all hours of the night finding out what she was doing, who she was with, what she was wearing, where she was going etc…. you get the point. I made myself sick with jealousy “literally” I could not sleep, couldn’t eat, I always had a huge knot in my stomach and my mind was just always running away from me thinking of all these potential things that may or may not happen. My mother used to tell me that I sounded psychotic on the phone and looking back she was right. It wasn’t until my girlfriend broke up with me at the time that I realized what I was doing. I remember like it was yesterday sitting on the back stairs of my Boston apartment pondering what I could have done differently and what did I do wrong and almost in an instant I had an epiphany. Literally everything that I was trying to do to prevent losing her was exactly the reason she did leave. I was stifling every part of who she was and totally suffocating her with my “what if mentality” what if she meets someone else, what if her friends try to take her away from me, what if she looks to good when she goes out and other guys try to pick her up, what if she see’s someone better looking than me, what if she likes another guys personality better than mine, I think you get the picture. If you believe in the law of attraction than I was working it perfectly if I wanted to lose my girlfriend. The key words here for me are an anticipated loss, we are expecting to lose something and so ultimately our wish comes true. With what I know now I’m not spinning my mind around worrying about what might happen instead if something ever did go wrong I will just deal with it once not a thousands times for something that may never come to pass. It’s kind of comical how life comes around full circle and karma kicks in because when I met the love of my life over 20 years ago she was actually worse than I was when it came to jealousy. Oh boy did the roles reverse and now I was at the receiving end and all I could think was “wow this used to be me and now I know what it feels like” and holy cow is it exhausting. Thankfully for me I was able to coach my wife based on what I had learned from my past and eventually the jealousy subsided and eventually disappeared for good. Living a life of love and happiness is about accepting each other for who you are and encouraging the one you love to be exactly they way life intended them to be not who you want to mold them to be. Successful relationships have many things in common such as good communication, affection toward one an other, quality time etc…. but most importantly they accept each other and don’t focus on the potential future problems. If you are struggling with jealousy then I suggest taking some quite time to yourself and writing down on one side of a piece of paper all the positive things that you get from being jealous and on the opposite side write down all of the ways being jealous negatively impacts not only your life but that of the one you love, read this over and over daily and let it settle in I’m sure that it will be an eye opening experience! If you truly want your love to last and want a life that is fulfilling and fun then forget about what might happen and focus on whats happening in the moment, enjoy one an other. Your story on jealousy was a mirror to mine..actually made me cry. It was spot on about how physically sick it makes you. Was a huge part of my break up with my boyfriend of 5.5 years. We have since decided to work on things, and actually seeing a couples therapist to deal with trust and jealousy issues. Unfortunately we weren’t successful figuring out on our own how to come to terms and be happy like we once were. Thank you for this eye opening story. And I made a copy to hold on to for reference when I have a weak moment. 🙂 So good to know there IS hope! It is such a very difficult thing to go through but as you said there is hope and I know that you can get through it, the road may not be easy but in the end your life will be forever changed. I’m very happy to hear that our story brought you comfort as it was our intention for it to help others. I wish you all the best with your boyfriend and keep the faith that it will get better!